Sue Pollock of Metro Brokers-Pollock & Company is a proud sponsor of Animals Asia, a non-profit organization dedicated to ending cruelty and restoring respect for all animals throughout Asia. More specifically, their mission is to end the farming of bears for bile in Vietnam and China; providing sanctuaries for these rescued bears; ending the suffering of wild animals in captivity being used for entertainment and ensuring humane treatment of dogs and cats by discouraging “dog markets” by building a common respect for these species. 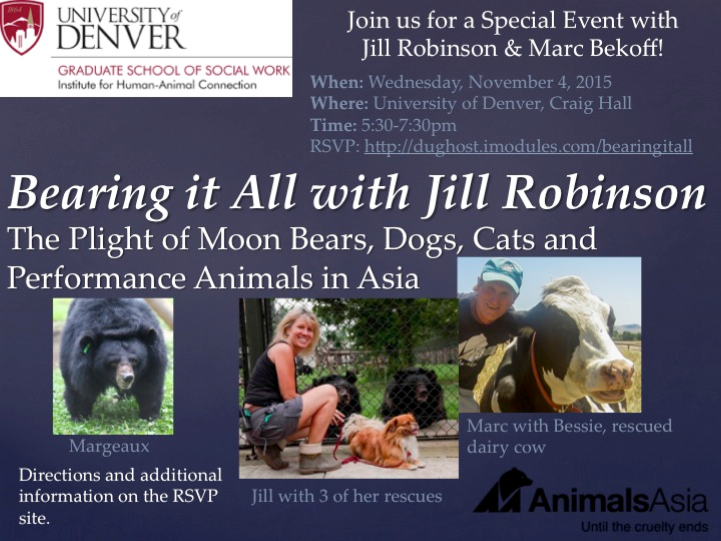 Jill Robinson, CEO and founder of Animals Asia, will be in Denver on November 4, 2015 to deliver a presentation about the organization, its work and its goals. Being an avid animal lover, Sue is hoping that fellow animal enthusiasts and supporters will join her at this important and informative event. Ticket information is below. Please join us for an Intimate VIP Reception with Jill Robinson after the presentation. Dessert and drinks will be served. Is it Time for ‘Boomerang Buyers’ to Bounce Back?